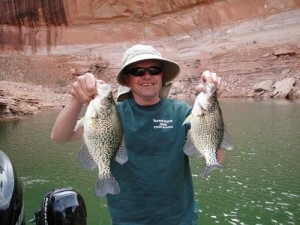 Lake Powell and Starvation are great to fish with friends and family. I went down to Lake Powell on April 30 this year. It’s a trip I make every spring, just before the new moon in May. It might sound odd if you don’t fish, but there is something about the few days just before a new moon that really excites the fish. Earlier in my fishing life, I wasn’t particular about when I fished. Now, after looking at the moon phases (and my fishing successes and failures), it seems like more than just a coincidence. Ryan Mosley holds a bass he caught in one of the canyons. Our group had a great trip! On this trip, I met up with several great friends at Bullfrog Marina. We boated to our favorite fishing and camping spot in Good Hope Bay. (There are many great camping spots in Good Hope Bay that get you out of the inevitable spring winds.) We fished just south of the bay in Seven Mile Canyon. Roger Schneidervin caught some of the crappie we cooked for dinner later that night. The canyon has a submerged grove of cottonwood trees that have made for some great crappie fishing over the past five years. This year was no different. We caught our limit of 12- to 15-inch crappies and cooked them up in fish tacos (see the recipe below). The time of year, moon phase and water temperature (60–65° F) produced fish that were really active and feeding heavily to prepare for spawning. 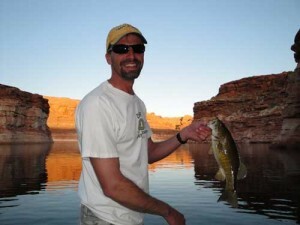 The largemouth and smallmouth bass were on spawning beds and were very fun to sight-fish for. The striped bass were just about ready to spawn. It’s a time when many large females are caught in the backs of the larger canyons (not to mention the smaller males just out from the females). We spent one whole day fishing for striped bass in the Blue Notch area on the north end of Good Hope Bay. All in all, we had great fishing conditions and very little wind until the last day, which I took as a sign that it was time to go home. Walleye have a reputation for being finicky and difficult to catch, but Starvation has some of the best walleye fishing for beginning walleye anglers. 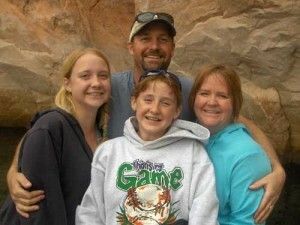 Our family fishing trips have resulted in some fun stories and memories. I'm looking forward to Starvation again in a few weeks. I take my wife and kids to Starvation because the fishing technique is a jig tipped with a nightcrawler. That’s as simple as it gets for any angler. We just drift on the breeze or use the electric trolling motor to work the shoreline. Walleye are typically only active in a certain depth of water. So, if we catch one walleye in 15 feet of water, then that’s where we focus our efforts. When your fellow anglers are impatient — like my wife and girls sometimes are — there have to be some easy-to-catch fish around. If the catch rate slows down, the family loses interest and pretty soon they are reading a book or suntanning. On a couple of trips, we just anchored in Rabbit Gulch and let the kids swim while we caught fish. The best thing about fishing at Starvation is that it is never crowded. Most days, you’ll have maybe 5–10 boats to compete with on a 3,000-acre reservoir. The facilities are really nice as well, and that’s pretty critical when the whole family goes fishing. Don’t forget lime wedges and salsa for those tacos! Starvation has been a fun place to fish for rainbows this year, but all of the walleye I’ve caught there have been small ones. I did catch a perch though that was within an inch of the state record. The crawdads there are awesome, too. You want nice walleye, try Deer Creek or Willard. I have run into some crowding issues at Starvation, anglers, boaters, and water recreationists have definitely gotten in each others’ way a few times in the last month that I’ve been there. Saleratus Wash along the channel where the water diversion enters the reservoir. It is very close to shore and seems to hold walleye throughout the summer.